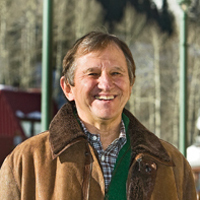 Harry Frampton serves as Chairman of the Board of the Vail Valley Foundation and was a friend of President and Mrs. Gerald R. Ford. President and Mrs. Ford were very supportive of the mission of the Vail Valley Foundation and served on its board of directors. The Foundation was instrumental in developing a park and an amphitheater that are named after President Ford. The Foundation also co-sponsored the AEI World Forum that President Ford founded. Harry Frampton was interviewed for the Gerald R. Ford Oral History Project on June 25, 2010 by Richard Norton Smith. Smith: First of all, tell us the difference between Vail and Beaver Creek. Frampton: Well, they’re both part of the Vail Valley, but they’re separate communities. Vail was here first. It really started in the early 60s. Beaver Creek didn’t start until 1980 or’81. So, they’re two distinct communities although they’re only four or five miles apart. Smith: Could either one of them happen in today’s regulatory/environmental economic climate? Frampton: The answer is probably not. And, in fact, around 1980 or ’81, I’m not sure exactly, Sports Illustrated had a wonderful article on Beaver Creek. It was a major article and the title of the article was “The Last Great Resort” and that was ’80 or ’81. Smith: And is that in the tradition of, say, Sun Valley? Frampton: What it basically said is that there really aren’t very many places left in the United States to build a project like Beaver Creek. That the environmental rules and regulations basically made it extremely difficult and, to some degree, the money was too significant to get anybody to do it; but it was more the environmental issues – that there were just not any places left. And if you really look at it, there hasn’t been a new resort built in the United States in a mountain community since Beaver Creek was built in the early ‘80s. Smith: Is it fair to say that this is an outgrowth of Vail? Frampton: That’s a pretty good description, yeah. Smith: How did you first meet the Fords? Frampton: That’s a great story. I became president of Vail Associates, which is a public company, in 1982. Vail ran the Vail Ski Mountain, which was a very profitable business, and was involved in building Beaver Creek, but they had gotten in financial trouble, probably because this business culture or this company was skiers. Also, in 1981, ’82, the recession was difficult. So, the company had gotten in trouble financially and I was hired to be president of the company and this was unusual for somebody to come from the south and who had only skied a few times. Smith: What had you done before? Frampton: Well, I’d been in the resort real estate business in Hilton Head, primarily, and other places. They needed somebody to come in who had an understanding of real estate development because of Beaver Creek. They also wanted somebody who understood operations, and I did. But it was golf and tennis as compared to skiing, so I wasn’t hired for my skiing abilities. I became president at a young age; I think I was 38 in 1982. And one of the first things you had to do is go meet President Ford, who was actually moving into his house near Beaver Creek. He was originally living at his condo in Vail and he decided to move down here along with Dean Keaton, who was a good personal friend, and Leonard Firestone, who’d been ambassador to, I think, Switzerland, if I’m not mistaken. So I’d been here literally two or three or four days and I got this call from President Ford just out of the blue. It’s a big deal, I mean, a former president calling me. I took the line and he introduced himself and he said he wanted me to come down to his house because some of the landscaping in the street that was not on his lot, didn’t look very good. And I said ‘sure’, so I got in my car and went down to Beaver Creek. He and Betty were there. I’d been on the job two or three days at the time and he walks out. There was a median in the street and it looked pretty scruffy. Smith: Of course, it was brand new, wasn’t it? Frampton: The house was brand new. Well, the street had just been built, but it was a big median and it had not been landscaped very well. It didn’t look very good and he didn’t like it. And so, he said, “We’ve got to get this fixed.” And he had said that he talked to somebody that worked for us who ran landscaping and this particular guy had said they were finished, that they weren’t planning on doing anything else. And I said, “President Ford, we’ll have the landscape guys over there tomorrow and it’ll look good the next day.” And so, I called somebody, I don’t remember who, and literally the next morning, we had these cute little girls out there planting the flowers and it looked gorgeous. And because I did it in one day, I think it started a pretty good friendship with President Ford and Betty. I mean, like all of the rest of us, they wanted the street to look nice, which was special. So, that was my first meeting. Smith: Were there things about them that surprised you? Frampton: That he was just a comfortable person. That was what was nice about him and Betty both. And I always remember about three or four weeks later, they asked us to dinner, which was a big deal. Of course, Susan, my wife, was terrified as you would expect – former president. We went to dinner and there were four other couples and he just couldn’t have been nicer. He asked her meaningful questions about our family and our kids and why we were here. And when he asked them, it wasn’t perfunctory. It was like he really had an interest, and that was nice and comfortable. I have to tell you one little cute story about that dinner because this was a big deal. By the way, Leonard Firestone was there and three or four other couples. We got there and the dinner was early, like 6:30, and we had a drink on the porch and then we went in and had this nice dinner. It was at a round table and it was very nice. We all ate and we’d been there, I don’t know, an hour and a half or two hours and we’re still talking and I could sense that this could last for another two hours. President Ford just stood up and said, “This has been a terrific evening. I appreciate all of you coming.” And we all got up and left because President Ford did not like to stay up late. But he handled it with great care and at 8:30 we were home. Frampton: They were obviously close friends and they got to know each other, I think, in California, if I’m not mistaken. When President Ford built his house here, Leonard Firestone built his on one side and Dean Keaton built his on the other side. In the early years, Dean spent a lot of time here, but as he got a little older, he didn’t spend as much time. But they just were friends, is how I would describe it. They weren’t in business to my knowledge. They may have had some business connections, but it was a kind of personal friendship and Dean was a nice guy. He was chairman of the AT&T Golf Tournament. He may have actually been the chairmen of it when it was the Clambake with Sinatra and all those guys, but he was in that California crowd. He was a nice person. Smith: Now, you were very significantly involved in the Vail Foundation. Smith: Which built, among other things, the Amphitheater? Frampton: Yes, the Foundation has done a lot of things. We built the Ford Amphitheater, raised money for that. We actually built it once and then we tore it down and built it again. Smith: Do you remember roughly what it cost? Frampton: Well, the rebuild was about twelve or thirteen million dollars which would probably be about 30 or 40 million today. And, of course, the Foundation was involved in building the Vicar Center here in Beaver Creek, which Ford was involved in, and we ran all the ski racing, et cetera. And, you know, they asked President Ford to go on the Foundation board and he was on that board from 1982 until he passed away. We had two board meetings a year, big board meetings. I don’t believe he missed a single board meeting and, if he did, I don’t remember it. We would always get him the book a week before time and he’d read it. He always asked some good questions. And the other great thing about President Ford is that we started on time. We’d started at 8 o’clock and we didn’t start 8:01 because he always got there perfectly about 10 or fifteen minutes until. He wanted to start on time and that was the trick we learned. But he was a good board member, is the point I’m making. It was not some perfunctory thing. He was engaged. He read the book. He had questions and he was very thoughtful of our board for a long period of time. Smith: Let me ask you – it may be an awkward question. Was he a generous board member? I mean, because I’ve seen his name on some things. Frampton: Well, he always made his annual contributions, he and Betty, to the Ford Amphitheater and they were generous financially. We certainly had a lot of donors that gave a lot more money, but he always gave money. Every single year, he made contributions in different amounts, but he was particularly generous in just that he worked. I mean, I can’t tell you how many times, we’d call him up and say, “President Ford, we need you to call so and so,” and he’d make those calls or he’d meet those people for coffee. And that’s really what you’re looking for in a board member. Smith: The reason I ask is because he was a fiscal conservative in the traditional sense. As president, he had not been reluctant to veto bill after bill after bill, probably the last president to ever hold the line on spending. And there is some dispute over how generous a tipper he may have been. Frampton: That’s probably Luke and Liz saying that. Smith: No, I think, at the restaurant, they say it was 20% which, frankly, comes as a surprise based upon what we’ve heard of on the golf course. Frampton: No, I don’t know that. I do remember one time we were thinking in the Foundation of starting an endowment and President Ford said he didn’t like the idea of an endowment at our organization. He said he thought if we had to go out and raise the money every year, it would keep us on our toes better and we would be more customer service oriented. So we really never raised an endowment. And I think, in our particular case, it was right though there are other cases where you need to do it. If you go back to how they were involved – I know on numerous occasions he’d go to the public schools and also went to Vail Mountain School where our kids were. I say ‘numerous’, he did it once every year or so, but I remember him going in and talking to the kids at Vail Mountain School and explaining the fundamentals of the three branches of government and the checks and balances and so forth. So, I think it was pretty nice that a former president living here would make an effort to do something like that. There were a lot of instances with that kind of involvement. Smith: We’ve heard that they were, as in the desert, not only very visible, but actively involved in a lot of civic activities. Frampton: And they worked and they actually did some things. And I guess he always kind of enjoyed Vail. People didn’t follow him too much. I mean, they respected him, but he could be a little bit of himself. Smith: It has also been suggested that they were significant in helping to establish this as a summer resort place. Frampton: Oh, there’s no question. I mean, I wasn’t here during those early years when he was here, but you can’t even begin to measure the impact he had on Vail and helping to create Vail. I mean, if you go back to the Ford Golf Tournament, it was phenomenal for the 20 years that went on and all the people that came here as part of that. I mean, it was truly phenomenal. Smith: And when you were developing Beaver Creek, was he there at all? Their house was already there. Did you have conversations about what this area was going to look like? Frampton: Well, we did, although the people who had planned it actually before I came here had done a really good job on the master plan and had communicated it effectively through some models and so forth. So, there was an outline that was quite good. It was a really good master plan. So, if you were buying early, you knew what the hope and the vision was for Beaver Creek. On the other hand, very little of it was here, so what you didn’t know was if it would be implemented. Smith: Sure. It was an abstraction. Frampton: It was an abstraction. That’s exactly right. Smith: If you look out here today, is there anything that significantly departs from or adds to that original plan? Frampton: Well, I think the thing he was so helpful on was the idea of the Vicar Center. Actually our company came up with the idea, as a part of the real estate development, to build a performing arts center here in the middle of the village, to activate the village, make it more lively, and certainly more diversified. But it was expensive. I forget what it cost, but it was fifteen million dollars which would be 40 or 50 million dollars today. And so we, as a developer, couldn’t afford to do all of that. We made our contribution, but we had to get private funding to do that and President Ford was incredibly influential in the raising of that fifteen million dollars. I mean, he made phone call after phone call and got behind it and stood up in public meetings, probably not unlike he did for some of the wonderful things he worked for out in the desert. But we raised that fifteen million dollars and it’s an incredible facility. I don’t know if you’ve seen it, but it’s absolutely wonderful. Smith: Is it one large hall? Frampton: It seats about 500 people, it’s under the ice rink, it’s phenomenal. We’ll have about 100 events every year, phenomenal artists that go there. It’s really added to the fabric of the Vail community and one of the things I know President Ford made a speech on one time. I remember the speech was how to develop an arts program where the children of the Vail Valley could have an opportunity to experience the arts center. What we did is we started an outreach program with the public schools and when we’d have an artist here, who’s maybe playing at night and we’re paying him money, we’ll often go to those artists and say, “Would you be willing to put on for ‘free’ a concert for kids during the day that afternoon?” and so forth. And, last year, we had about 6,000 children go to some event at the Velar Center. To be able to get that many kids incredible exposure to art, dance, music, theater, drama, et cetera, was pretty cool. So, there’s no question that that was something the Fords were very supportive. Smith: And what is the population of the Vail Valley? Frampton: The range is 40,000 living here full time. Obviously in the middle of the ski season, it goes up. Smith: By the time you came out here, was he still skiing? Frampton: He was still skiing. He skied a pretty good while. I can’t remember exactly how much longer, but, no, he skied in the ski season and he was good. Smith: Did he ever say anything conversationally about the caricature – the whole Chevy Chase business? Frampton: No, I don’t say that we ever in essence talked about that. But, you know, two observations. I mean, one, it was true, he was clumsy. He was obviously a great athlete, but he was clumsy. I mean, I probably played golf with him ten times, or 15 times, and he was a pretty good golfer, but he couldn’t get out of a sand trap. And a sand trap requires a little finesse. It’s different than hitting the ball. He’s the worst player I’ve ever seen out in the sand trap. He just could not get out. So, there was a little bit of truth to that. He was a good athlete. As you know, he swam every day at least once and sometimes twice. He obviously was a great football player at Michigan and whatever, but he was not a finesse athlete. Smith: That’s well put. Later on, I think Mrs. Ford mastered the computer pretty early. Frampton: Oh, he’d been terrible at it. Smith: He could read his email, but he couldn’t respond to it. Frampton: Oh, absolutely not. And I think another thing, sports-wise, I always got a kick out of – he was always such a Michigan sports fan. So throughout the fall when he was here – because he used to stay here through November, nothing else happened on Saturday – on Saturday afternoon, President Ford got in front of the TV to watch the Michigan Wolverines and that was a given. Smith: And you didn’t interrupt. Frampton: You did not interrupt, though I was lucky. I got to watch one game with him; it was one Saturday, with four of five people. It was fun. Smith: Did he get very involved? Frampton: Oh, yeah, he was. Absolutely. He was a fan. He could tell you all the players and the coaches and so forth, which is nice. Smith: And I take it that they had a number of friends in the area. Frampton: Oh, yeah, particularly some of the people that were here early, people like the Meijers and Peppy and Shaika and the Slifers and the Keltons. There was a whole group of people. And when you’re here early in a resort – and that would be earlier than I was here, although we got it to some degree – there’s kind of a pioneer spirit, you’re kind of all in it together. Smith: And you had your vision vindicated over time. Frampton: No, but I saw Betty’s one time. We were laughing about it last night when I was talking about this interview. We have something here we call the Porsche Tea Dance and it’s held during the ski races every year. So, about 4 or 5 o’clock in the afternoon, they have this tea dance and they have, you know, coffee and tea and that kind of stuff. Well, Betty loved to dance and President Ford’s like me, he’d just as soon be shot as dance. And they were playing some song, I don’t remember what it was right now – it was a band, it was like Frank Sinatra or something – and they were sitting at the table with three or four couples and ourselves. She wanted to dance and he didn’t want to and I thought she was going to kill him right there on the spot. And she finally reached over and grabbed his arm and absolutely physically yanked him out on the dance floor. Anyway, I did see Betty mad. Smith: You talked about his punctuality. It was a religion, punctuality, and she’s quite the opposite. Did you ever observe that? Frampton: I’m not sure. I don’t think so. Smith: What about his sense of humor? You told me he wasn’t a joke teller. Frampton: I think being in that kind of position, you just have to, by nature, be a little more serious. Smith: Did you talk politics? Contemporary events? Frampton: We did talk politics a little bit. Not at great length. In my own particular case, I’m a moderate Democrat, but in many respects, if the Ford of the Republican Party were in power today, I’d probably be aligned much more closely with Ford and his beliefs. I mean, he was a fiscal conservative, absolutely, but on the other hand, he didn’t take it to the extreme that some groups take it today. I mean, he was pro-choice, as we know. Smith: In my eulogy in Grand Rapids, I made reference to the fact that most of us get more conservative as we get older. Fiscally, he certainly remained a traditional, budget-balancing conservative. But when it came to a lot of social issues…you wonder whether it was partly that the party had just moved so far to the right, or whether maybe she had some impact or the children or what it was. And then I wonder, having gone through the intervention with her and the compassion that all of that entailed, whether that was a factor. I’m thinking of abortion rights or gay rights, things that you don’t associate with the conservative Republican. Frampton: Oh, very much so. I think that’s right. And I can remember him lamenting the days when there was more collaboration and you didn’t have the poison in the air. I can remember him making a few comments about him and Tip O’Neill. That they would strongly disagree on the issues, but they would sit down, they wouldn’t personalize it, and they would look for common solutions. And I thought that was good. And he wasn’t, in my opinion, so anti-government everything. I mean, I do believe I’m right that, in his presidency, he put in the gas mileage EPA rule. I’m not sure if it was the EPA. So, he recognized that there was a role for government. In certain circumstances, it needed to be temporary or it needed to be modified because he was conservative, but he wasn’t extreme. And he also recognized that we all kind of need to work together here. I can remember him saying this – we would be more successful if government and business and people worked together in collaborative partnerships. Smith: That says something about how the relationship with Jimmy Carter evolved. Again, if you’d done an interview with him in 1977, you’d get a very different portrait of that relationship than if you talked to him twenty years later. I’ve often wondered if one of the things that brought them together is that they both ran against Ronald Reagan. Frampton: Could be. But Ford was somebody who wanted to get things done. He was action oriented. I mean, clearly he was a Republican, but he also just wanted to do good things for the country, where politicians, in my opinion, today are just so paranoid in preserving their own party that they lose any sense of doing some smart balancing. Smith: I’ve also wondered whether part of the fiscal conservatism was a by-product of the Depression. Frampton: Of course. He’s the same age as my parents. Absolutely. My mother still saves the Christmas wrappings from one year to the next as I’m sure President Ford would, too. Smith: How do you think he handled aging? Frampton: I think he handled it great. I don’t know about that last couple of years because we didn’t see him then, but up until then. How old was he when he passed? Frampton: Then certainly through 90, he was terrific because he was coming back here. I played golf with him, which I thought was wonderful. I’m going to guess he was 89 or 90 and he wanted to play. He called and we played four or five holes. He wanted to play so bad and one of the security guys stood behind him so he could stand up. It was just unbelievable. He couldn’t stand up, yet with the assistance of this guy, we played like four or five holes. And, by the way, he was not embarrassed by that at age 89 or 90. I mean, he was glad to be out there. Smith: We’re told he was very competitive. Frampton: Oh, yeah. He wanted to do it. And, of course, the other thing is that he always was on top of everything. I mean, you could talk about almost any political subject. And that was really before the internet if you think about it. Frampton: Oh, yeah. And he would talk every week, I know, to a lot of people whether it be former presidents or colleagues, et cetera. He was engaged. Frampton: You know, I’m not sure that I do. No. I don’t think I do. A good man. Frampton: That’s a wonderful question. I just think as a giver, somebody who gave a heck of a lot more than he took, whether it be with family or work or business or government or whatever. He was a giver. Smith: That’s interesting because, you know, there was criticism of him for ‘commercializing’ the ex-presidency, which really boiled down to the fact that he went on boards. You’ve already mentioned your board in particular. Our understanding is that he took the same attitude toward all the boards that he was associated with. I mean, he was never window dressing. Frampton: Wouldn’t everyone want to make some money for his family or his kids? Let’s not begrudge that. I mean, he made some. He certainly didn’t get rich, super rich, but he was good. But he wasn’t preoccupied with that. I mean, we were a volunteer board and he’d go talk to the kids at the school. He may have been on the American Express board for a long time and I remember he was on the Travelers’ board. But all that time, he was leading a balanced life. Smith: And that’s what didn’t get covered. Smith: The campuses he visited. The charity work that he did. Smith: And, again, he and Jimmy Carter, one of the things that brought them together was the fact that both had to raise the money to build their presidential libraries. For him, that was something like fifteen million dollars, which doesn’t seem like much now, but to him it was pretty daunting at the time. Frampton: A staggering amount of money. Smith: Absolutely. For someone who had never spent much on a congressional campaign, he really had nothing to compare it with. Smith: She had a lot of friends. Frampton: Oh, yeah, I think one of the great things she did was the Alpine Gardens here. Smith: We went yesterday. Very Impressive. What were the origins of that? Frampton: You know, I’m not sure I quite know to be honest. Smith: Did it start before you arrived? Frampton: No, I just don’t know how it began. A wonderful lady I knew, Helen Fitch, and Betty were close friends and, a landscape architect, Marty Jones -I don’t know whose idea it was at first – but they were all there very early. She loved flowers. Flowers that are housed here are always gorgeous in the summertime. She used to go out there on Saturdays and pull weeds. Frampton: Right, in addition to doing some fundraisers. But she worked like everybody else. Frampton: Yeah, that was very nice. Smith: And I take it there were people here, some of them have said as much to us, who had occasion to avail themselves of the Betty Ford Center. Frampton: Oh, yeah, absolutely, throughout the community. I’ll tell you another cute story about the Fords, a fun one. He had called one time and said he wanted to go play golf in Steamboat which is an hour away. And he said, “I’ve been playing golf a lot in Vail and I’ve heard Steamboat’s a really pretty place. I’d like to go there and play golf.” So we set up a trip with four couples. We got a bus and the idea is we would leave here in the morning at 8 o’clock or whatever, go over there and the spouses would go into downtown Steamboat and shop and have lunch for a couple of hours while the four guys would play golf, and then get back together and come back. He said he wanted to go and who he wanted to go and I called the other two couples. We were all set up. Sadly, I got the flu the day before, so what I’m now telling you is secondhand. I’m crushed that I didn’t get to go, but I’m pretty sure it’s true. That night was the night of Desert Storm, the night before the golf trip. Of course, it was the first war that was really ever covered live by CNN and everybody was glued to their TV sets. But the next morning the group headed to Steamboat on the bus, a very simple old bus, and they got to a little town between here and there called Yampa. I mean, Yampa is a crossroads – if fifty or a hundred people live in Yampa, I’m surprised – and there’s one bar downtown. They get to Yampa on the way to golf and the bus breaks down. They have a couple of Secret Service guys on there, too. So, the four couples walk into this very grungy bar at 8 or 9 o’clock in the morning and it’s really grungy and there are one or two guys in there. They walk into the bar and there’s nobody there, but there’s a TV going on and it’s CNN covering the Gulf War. There’s a bartender there, of course. So, they all sit down and they get coffee or food or whatever and, of course, the bartender immediately comes over to start asking President Ford all these questions about the Gulf War, I mean, ‘Should we?’, ‘Should we not?’, this, that, and the other. Of course, this bartender had been up all night long and he knew a lot and was just absolutely right. Well, they had to bring another bus which would take about an hour and, from what I understand, about the time the other bus got there, there were about fifty people that had come to the restaurant because word had spread throughout the community that a former president was in there and he was answering questions about the Gulf War. Anyway, I don’t know if you want that on tape, but it’s a great little story. Smith: Were you surprised by the amount of reaction when he passed away? He’d been out of the public eye awhile, but it was really significant and it seemed to build as the week went on. Frampton: Well, I think we were all surprised in some respects and then we weren’t surprised. If you took time to think about it, it was amazing how many people from here went to the service out in Palm Springs and then we went to the National Cathedral and it was an outpouring. I think maybe if you think back about it, it was a little bit of nostalgia and that politics has gotten so darned ugly now and so unpleasant. I just really hate it. If Ford represented anything, it would be a little bit more civility. Maybe people longed for that a little bit. Smith: I think there’s a lot of truth in that and I think there’s a whole generation that were being introduced to him for the first time, they were watching these old film clips, and comparing it with the ugliness of contemporary politics. And it was right at the time the country needed to feel good about itself. Frampton: Yeah, no question. That’s a good point. Smith: What’s the future of this place? Frampton: Well, I think, Vail will continue to do great. A lot of the reason why is because of the good foundation work Ford and others did here. It’s pretty much built out now, but as long as we have great skiing and 80 degree weather and no humidity, we’ll do fine. Smith: You have a lot of elements going for you.